Looking for the perfect summer dessert? Look no further as these beauties are the perfect addition to your picnic basket. Serve these babies up while relaxing by the lake or hanging out on the beach. They’re light and airy with just a hint of sweet. Turn them into cupcakes for this year’s Fourth of July cookout. They’ll be a huge hit. Preheat your oven to 325. Beat the egg whites with the vanilla, cream of tartar and salt in a large bowl, using an electric mixer on medium. When the mixture becomes foamy and very soft peaks have started to form, slowly add in half of the sugar. Beat just until soft; moist peaks should form. In a small prep bowl, sift together the remaining sugar with flour. Using a spatula, fold the flour mixture in with the peaked egg whites one quarter at a time. Pour the batter into an ungreased pan. Bake 35 to 40 minutes. Remove from the oven and allow to cool for 1 hour. Remove the cake from the pan by using a knife to move along the edge, separating the cake from the pan. Place a plate on top and turn the pan upside down. The cake should slide out and onto the plate. Transfer cake to serving platter. 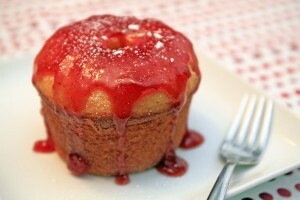 Top cake(s) with Strawberry Glaze (below) and garnish with powdered sugar. Gently heat strawberry jam over in a small pot over low heat. Once the jam becomes slightly liquid, remove from heat and whisk in powdered sugar. Wisk until all the sugar is combined.